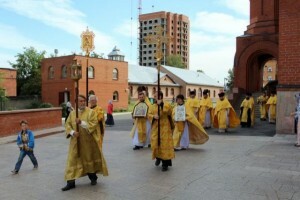 On September 24, 2015, with the blessing of His Holiness Patriarch Kirill of Moscow and All Russia, Metropolitan Hilarion of Volokolamsk, head of the Moscow Patriarchate department for external church relations (DECR) arrived in Khabarovsk for participation, in his capacity as permanent member of the Holy Synod, in the diocesan celebrations marking the centenary of the demise of the Holy Prince Vladimir Equal-to-the-Apostles, the Baptizer of Russia. At the airport Metropolitan Hilarion was met by Metropolitan Ignaty of Khabarovsk and Priamurie, Mr. V. Martsenko, vice-chairman of the Khabarovsk Krai government, as well as clergy and laity of the Metropolia of Priamurie. On the same day, Metropolitan Hilarion and Metropolitan Ignaty chaired a round-table conference on ‘Khabarovsk Seminary: A New Model of the Theological School’, attended by lecturers and seminarians, professors of higher education institutions in Khabarovsk, representatives of ethnic diasporas, and officials and staffers of the Federal Migration Service. The discussion focused on the model of educational work and system of practice-oriented training in Khabarovsk Seminary, the forms of its distance training and the efforts made by the Seminary’s center for study of East-Asian cultures in China. Metropolitan Hilarion drew the attention of the round-table participants to the qualities necessary for a contemporary priest as a messenger of the rich and living Tradition of the Church, a preacher of Christ and salvation. He stressed how important it is for the clergy to be able to bear witness to the truth of Orthodoxy in the modern language with awareness of realties and problems of today’s life. 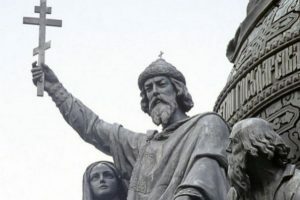 He dwelt on the need to organize missionary work in the Chinese diaspora in Russia, pointing to the importance of coordinating this service with the ROC church-wide efforts in the Chinese area and called the clergy to rely on the experience of the Russian Orthodox Mission in China. 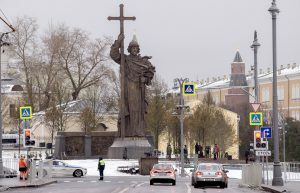 He also spoke about the reform of the theological education system in the Russian Orthodox Church called to close the gap between the structure of seminarian training surviving since the 19th century and the challenges of today’s world. Among important tasks is to create educational aids of new methodological type helping to mould the modern clergy. Metropolitan Hilarion met with the governor of the Khabarovsk Krai, Mr. V. Shport. In a warm and constructive talk, they discussed the development of a program of the religious and moral education of local people, social projects, problems of migration and outflow of people from the Far East, as well as the foundation of an Orthodox Center on Bolhoi Ussurijski Island. The governor made a special mention of the visit made by Patriarch Kirill to Khabarovsk and Komsomolsk-on-the-Amur in 2014 as important for creating a favourable climate in the krai and helping to settle social and interpersonal conflicts. During his trip to the Far East, Metropolitan Hilarion is accompanied by D. Petrovsky, DECR staffer, and A. Yershov, referent to the DECR chairman.